Stay in tune with everything you need to know about weddings in Athens. Break out your red and black and get ready to Call the Dawgs; UGA Football is back! 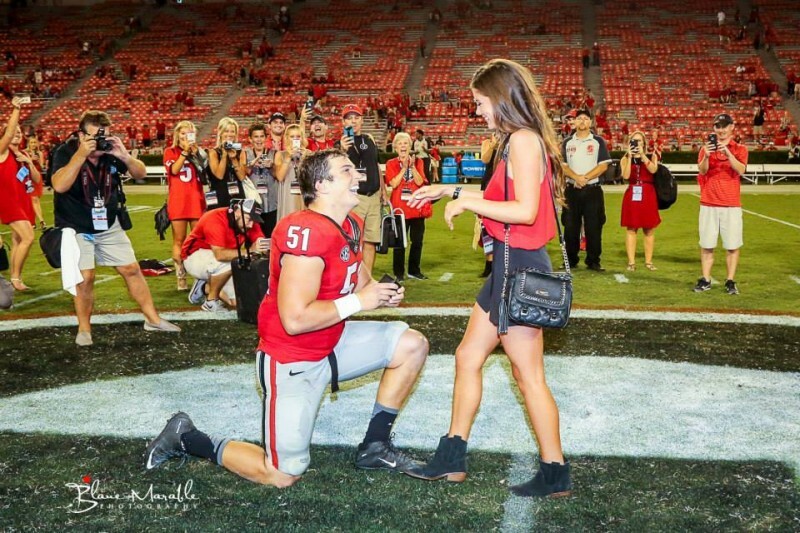 In honor of UGA’s first game of the season, we’re reminiscing on some of our favorite moments Between the Hedges–the engagements! Check out how some former football players incorporated their love of the game into a proposal to the love of their life. 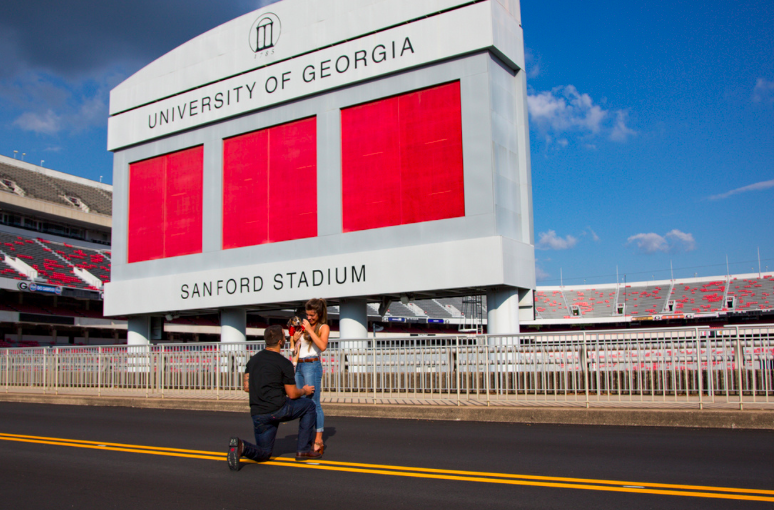 Ain’t nothing finer in the land… than an engagement in Sanford! Three years ago, after a UGA win over South Carolina, Jake Ganus popped the question to his now wife, Peyton. Surrounded by friends and family, Jake got down on one knee right on the 50-yard line. The couple began dating when they were sophomores in high school and married in 2016. Peyton recently gave birth to their first daughter. For more details on the high school sweethearts’ engagement, check out our blog post, Jake Ganus Proposes on the 50-Yard-Line. Who’s that coming down the track? 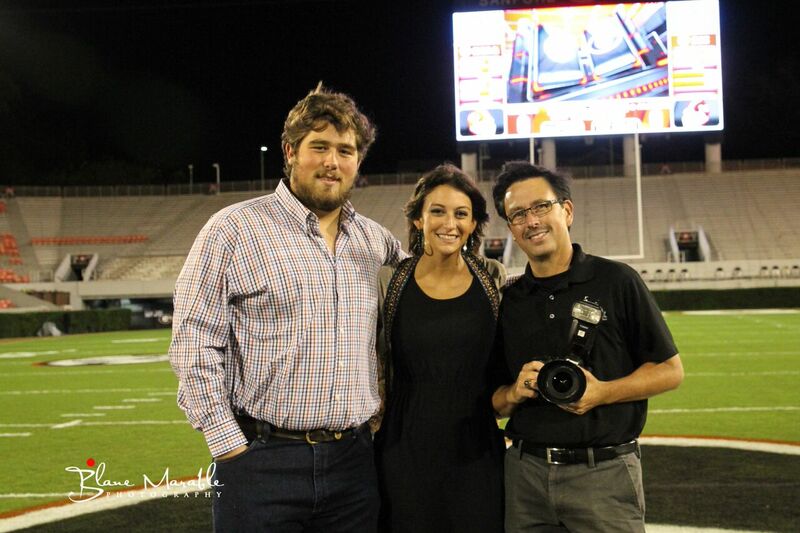 It’s David Andrews and his now wife Mackenzie. 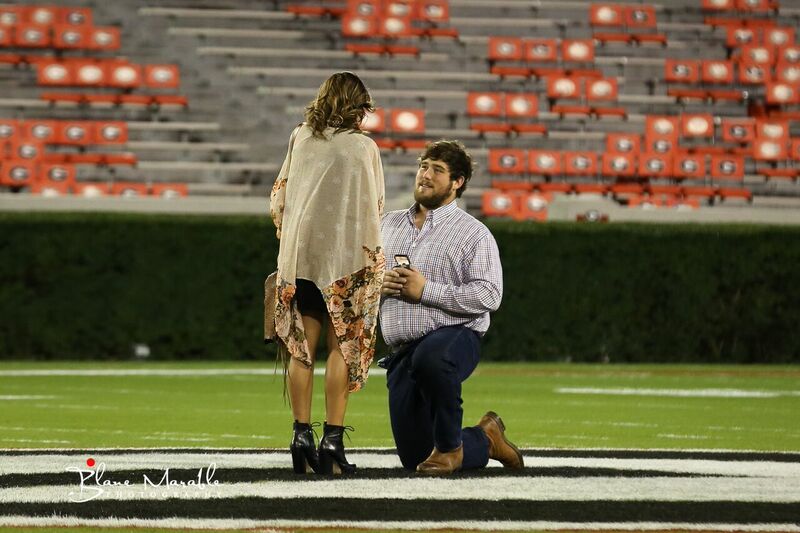 Just a month later, David proposed to his girlfriend right in the middle of the field on the Georgia “G.” There was no game that night, but the the couples’ family and friends watched from the sidelines. 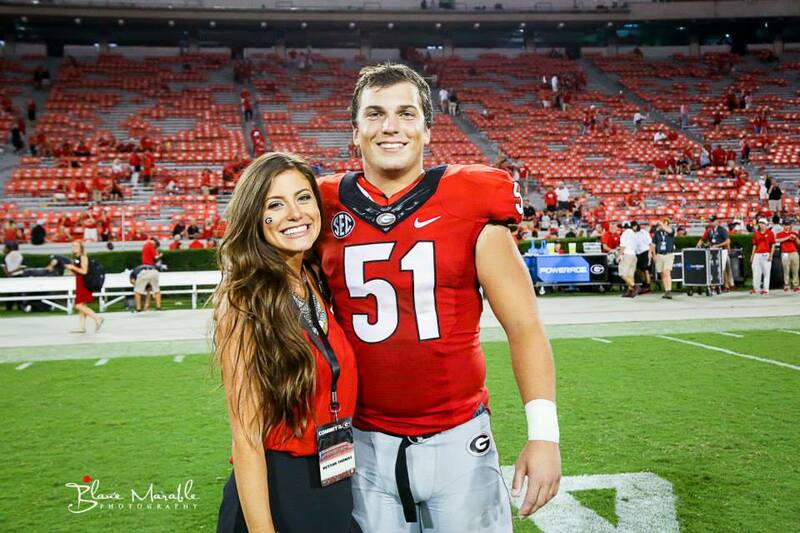 David played center for UGA from 2012-2014, and Mackenzie was a cheerleader. The two wed in April 2017 at Walnut Hills Farm Event Center. Read more about their love story and Andrews’ current football career in our post, From Engagement Rings to Superbowl Rings. To learn more about their venue, check out our Venue Spotlight: Walnut Hill Farms. This season, Sanford Stadium is showing off a new scoreboard. 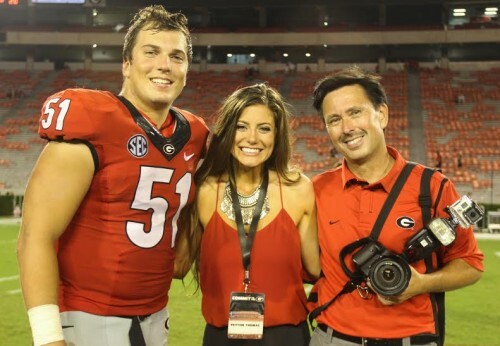 Two years ago, former UGA linebacker Ryne Rankin proposed to his now wife, Makenzie, in front of the stadium’s old scoreboard. Ryne led a blindfolded Mackenzie down Sanford Drive. Once the blindfold was removed, he got down on one knee. He even incorporated their dog into the proposal! The couple wed in May 2017. “It is always fun to capture proposal photos of Georgia football players. They know me from covering their games and feel comfortable around me. Of course the guys are always a little nervous about proposing. 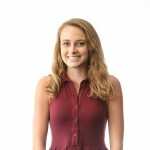 I try to reassure them and make sure they know that I will be in place to capture their proposal,” says Blane Marable, owner of Blane Marable Photography. Wishing our Dawgs the best of luck this season and continued happiness to these couples!